For other uses, see Book of Mormon (disambiguation). The Book of Mormon has a number of original and distinctive doctrinal discussions on subjects such as the fall of Adam and Eve, the nature of the Christian atonement, eschatology, redemption from physical and spiritual death, and the organization of the latter-day church. The pivotal event of the book is an appearance of Jesus Christ in the Americas shortly after his resurrection. The Book of Mormon is the earliest of the unique writings of the Latter-day Saint movement, the denominations of which typically regard the text primarily as scripture, and secondarily as a historical record of God's dealings with the ancient inhabitants of the Americas. The archaeological, historical and scientific communities do not accept the Book of Mormon as an ancient record of actual historical events. The Book of Mormon is divided into smaller books, titled after the individuals named as primary authors and, in most versions, divided into chapters and verses. It is written in English very similar to the Early Modern English linguistic style of the King James Version of the Bible, and has since been fully or partially translated into 111 languages. As of 2011, more than 150 million copies of the Book of Mormon had been published. 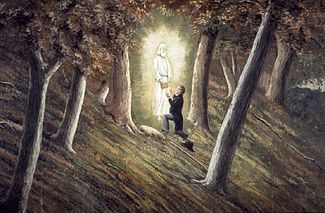 According to Joseph Smith, he was seventeen years of age when an angel of God named Moroni appeared to him and said that a collection of ancient writings was buried in a nearby hill in present-day Wayne County, New York, engraved on golden plates by ancient prophets. The writings were said to describe a people whom God had led from Jerusalem to the Western hemisphere 600 years before Jesus' birth. According to the narrative, Moroni was the last prophet among these people and had buried the record, which God had promised to bring forth in the latter days. Smith stated that this vision occurred on the evening of September 21, 1823 and that on the following day, via divine guidance, he located the burial location of the plates on this hill; was instructed by Moroni to meet him at the same hill on September 22 of the following year to receive further instructions; and that, in four years from this date, the time would arrive for "bringing them forth", i.e., translating them. Smith's description of these events recounts that he was allowed to take the plates on September 22, 1827, exactly four years from that date, and was directed to translate them into English. Smith's first published description of the plates said that the plates "had the appearance of gold". They were described by Martin Harris, one of Smith's early scribes, as "fastened together in the shape of a book by wires." Smith called the engraved writing on the plates "reformed Egyptian". A portion of the text on the plates was also "sealed" according to his account, so its content was not included in the Book of Mormon. In addition to Smith's account regarding the plates, eleven others stated that they saw the golden plates and, in some cases, handled them. Their written testimonies are known as the Testimony of Three Witnesses and the Testimony of Eight Witnesses. These statements have been published in most editions of the Book of Mormon. Smith enlisted his neighbor Martin Harris as a scribe during his initial work on the text. (Harris later mortgaged his farm to underwrite the printing of the Book of Mormon.) In 1828, Harris, prompted by his wife Lucy Harris, repeatedly requested that Smith lend him the current pages that had been translated. Smith reluctantly acceded to Harris's requests. Lucy Harris is thought to have stolen the first 116 pages. After the loss, Smith recorded that he had lost the ability to translate, and that Moroni had taken back the plates to be returned only after Smith repented. Smith later stated that God allowed him to resume translation, but directed that he begin translating another part of the plates (in what is now called the Book of Mosiah). In 1829, work resumed on the Book of Mormon, with the assistance of Oliver Cowdery, and was completed in a short period (April–June 1829). Smith said that he then returned the plates to Moroni upon the publication of the book. The Book of Mormon went on sale at the bookstore of E. B. Grandin in Palmyra, New York on March 26, 1830. Today, the building in which the Book of Mormon was first published and sold is known as the Book of Mormon Historic Publication Site. Since its first publication and distribution, critics of the Book of Mormon have claimed that it was fabricated by Smith and that he drew material and ideas from various sources rather than translating an ancient record. Works that have been suggested as sources include the King James Bible, The Wonders of Nature, View of the Hebrews, and an unpublished manuscript written by Solomon Spalding. FairMormon maintains that all of these theories have been disproved and discredited, arguing that both Mormon and non-Mormon historians have found serious flaws in their research. The position of most adherents of the Latter Day Saint movement and the official position of The Church of Jesus Christ of Latter-day Saints (LDS Church) is that the book is an accurate historical record. Smith said the title page, and presumably the actual title of the 1830 edition, came from the translation of "the very last leaf" of the golden plates, and was written by the prophet-historian Moroni. The title page states that the purpose of the Book of Mormon is "to [show] unto the remnant of the house of Israel what great things the Lord hath done for their fathers; ... and also to the convincing of the Jew and Gentile that Jesus is the Christ, the eternal God, manifesting himself unto all nations." The Book of Mormon is organized as a compilation of smaller books, each named after its main named narrator or a prominent leader, beginning with the First Book of Nephi (1 Nephi) and ending with the Book of Moroni. The book's sequence is primarily chronological based on the narrative content of the book. Exceptions include the Words of Mormon and the Book of Ether. The Words of Mormon contains editorial commentary by Mormon. The Book of Ether is presented as the narrative of an earlier group of people who had come to America before the immigration described in 1 Nephi. First Nephi through Omni are written in first-person narrative, as are Mormon and Moroni. The remainder of the Book of Mormon is written in third-person historical narrative, said to be compiled and abridged by Mormon (with Moroni abridging the Book of Ether and writing the latter part of Mormon and the Book of Moroni). Most modern editions of the book have been divided into chapters and verses. Most editions of the book also contain supplementary material, including the "Testimony of Three Witnesses" and the "Testimony of Eight Witnesses". The books from First Nephi to Omni are described as being from "the small plates of Nephi". This account begins in ancient Jerusalem around 600 BC. It tells the story of a man named Lehi, his family, and several others as they are led by God from Jerusalem shortly before the fall of that city to the Babylonians in 586 BC. The book describes their journey across the Arabian peninsula, and then to the promised land, the Americas, by ship. These books recount the group's dealings from approximately 600 BC to about 130 BC, during which time the community grew and split into two main groups, which are called the Nephites and the Lamanites, that frequently warred with each other. Following this section is the Words of Mormon. This small book, said to be written in AD 385 by Mormon, is a short introduction to the books of Mosiah, Alma, Helaman, Third Nephi, and Fourth Nephi. 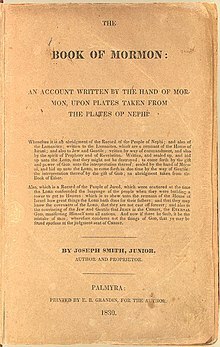 These books are described as being abridged from a large quantity of existing records called "the large plates of Nephi" that detailed the people's history from the time of Omni to Mormon's own life. The Book of Third Nephi is of particular importance within the Book of Mormon because it contains an account of a visit by Jesus from heaven to the Americas sometime after his resurrection and ascension. The text says that during this American visit, he repeated much of the same doctrine and instruction given in the Gospels of the Bible and he established an enlightened, peaceful society which endured for several generations, but which eventually broke into warring factions again. The portion of the greater Book of Mormon called the Book of Mormon is an account of the events during Mormon's life. 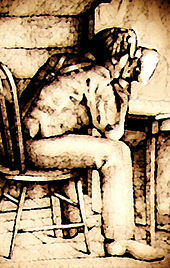 Mormon is said to have received the charge of taking care of the records that had been hidden, once he was old enough. The book includes an account of the wars, Mormon's leading of portions of the Nephite army, and his retrieving and caring for the records. Mormon is eventually killed after having handed down the records to his son Moroni. According to the text, Moroni then made an abridgment (called the Book of Ether) of a record from a previous people called the Jaredites. The account describes a group of families led from the Tower of Babel to the Americas, headed by a man named Jared and his brother. The Jaredite civilization is presented as existing on the American continent beginning about 2500 BC,—long before Lehi's family arrived shortly after 600 BC—and as being much larger and more developed. The Book of Moroni then details the final destruction of the Nephites and the idolatrous state of the remaining society. It also includes significant doctrinal teachings and closes with Moroni's testimony and an invitation to pray to God for a confirmation of the truthfulness of the account. The Book of Mormon contains doctrinal and philosophical teachings on a wide range of topics, from basic themes of Christianity and Judaism to political and ideological teachings. Jesus is mentioned every 1.7 verses and is referred to by one hundred different names. Stated on the title page, the Book of Mormon's central purpose is for the "convincing of the Jew and Gentile that Jesus is the Christ, the Eternal God, manifesting himself unto all nations." The book describes Jesus, prior to his birth, as a spirit "without flesh and blood", although with a spirit "body" that looked similar to how Jesus would appear during his physical life. Jesus is described as "the Father and the Son". He is said to be: "God himself [who] shall come down among the children of men, and shall redeem his people ... [b]eing the Father and the Son—the Father, because he was conceived by the power of God; and the Son, because of the flesh; thus becoming the Father and Son—and they are one God, yea, the very Eternal Father of heaven and of earth." Other parts of the book portray the Father, the Son, and the Holy Ghost as "one." As a result, beliefs among the churches of the Latter Day Saint movement encompass nontrinitarianism (in The Church of Jesus Christ of Latter-day Saints) to trinitarianism (particularly among the Community of Christ). See Godhead (Latter Day Saints). In furtherance of its theme of reconciling Jews and Gentiles to Jesus, the book describes a variety of visions or visitations to some early inhabitants in the Americas involving Jesus. Most notable among these is a described visit of Jesus to a group of early inhabitants shortly after his resurrection. Many of the book's contributors described other visions of Jesus, including one by the Brother of Jared who, according to the book, lived before Jesus, and saw the "body" of Jesus' spirit thousands of years prior to his birth. According to the book, a narrator named Nephi described a vision of the birth, ministry, and death of Jesus, including a prophecy of Jesus' name, said to have taken place nearly 600 years prior to Jesus' birth. In the narrative, at the time of King Benjamin (about 130 BC), the Nephite believers were called "the children of Christ". At another place, the faithful members of the church at the time of Captain Moroni (73 BC) were called "Christians" by their enemies, because of their belief in Jesus Christ. The book also states that for nearly 200 years after Jesus' appearance at the temple in the Americas the land was filled with peace and prosperity because of the people's obedience to his commandments. Later, the prophet Mormon worked to convince the faithless people of his time (AD 360) of Christ. Many other prophets in the book write of the reality of the Messiah, Jesus Christ. In the Bible, Jesus spoke to the Jews in Jerusalem of "other sheep" who would hear his voice. The Book of Mormon claims this meant that the Nephites and other remnants of the lost tribes of Israel throughout the world were to be visited by Jesus after his resurrection. The book delves into political theology within a Christian or Jewish context. Among these themes are American exceptionalism. According to the book, the Americas are portrayed as a "land of promise", the world's most exceptional land of the time. The book states that any righteous society possessing the land would be protected, whereas if they became wicked they would be destroyed and replaced with a more righteous civilization. On the issue of war and violence, the book teaches that war is justified for people to "defend themselves against their enemies". However, they were never to "give an offense," or to "raise their sword ... except it were to preserve their lives." The book praises the faith of a group of former warriors who took an oath of complete pacifism, refusing to take arms even to defend themselves and their people. However, 2,000 of their descendants, who had not taken the oath of their parents not to take up arms against their enemies, chose to go to battle against the Lamanites, and it states that in their battles the 2,000 men were protected by God through their faith and, though many were injured, none of them died. The book recommends monarchy as an ideal form of government, but only when the monarch is righteous. The book warns of the evil that occurs when the king is wicked, and therefore suggests that it is not generally good to have a king. The book further records the decision of the people to be ruled no longer by kings, choosing instead a form of democracy led by elected judges. When citizens referred to as "king-men" attempted to overthrow a democratically elected government and establish an unrighteous king, the book praises a military commander who executed pro-monarchy citizens who had vowed to destroy the church of God and were unwilling to defend their country from hostile invading forces. The book also speaks favorably of a particular instance of what appears to be a peaceful Christ-centered theocracy, which lasted approximately 194 years before contentions began again. The book supports notions of economic justice, achieved through voluntary donation of "substance, every man according to that which he had, to the poor." In one case, all the citizens held their property in common. When individuals within a society began to disdain and ignore the poor, to "wear costly apparel", and otherwise engage in wickedness for personal gain, such societies are repeatedly portrayed in the book as being ripe for destruction. Joseph Smith characterized the Book of Mormon as the "keystone" of Mormonism, and claimed that it was "the most correct of any book on earth". Smith produced a written revelation in 1832 that condemned the "whole church" for treating the Book of Mormon lightly. The Book of Mormon is one of four sacred texts or standard works of the LDS Church. Church leaders have frequently restated Smith's claims of the book's significance to the faith. Church members believe that the Book of Mormon is more correct than the Bible because the Bible was the result of a multiple-generation translation process and the Book of Mormon was not. For most of the history of the LDS Church, the Book of Mormon was not used as much as other books of scripture such as the New Testament and the Doctrine and Covenants. This changed in the 1980s when efforts were made to reemphasize the Book of Mormon. As part of this effort, a new edition was printed with the added subtitle "Another Testament of Jesus Christ". The importance of the Book of Mormon was a focus of Ezra Taft Benson, the church's thirteenth president. Benson stated that the church was still under condemnation for treating the Book of Mormon lightly. In an August 2005 message, LDS Church president Gordon B. Hinckley challenged each member of the church to re-read the Book of Mormon before the year's end. The book's importance is commonly stressed at the twice-yearly general conference, at special devotionals by general authorities, and in the church's teaching publications. Since the late 1980s, church members have been encouraged to read from the Book of Mormon daily. The LDS Church encourages discovery of the book's truth by following the suggestion in its final chapter to study, ponder, and pray to God concerning its veracity. This passage is sometimes referred to as "Moroni's Promise". As of April 2011, the LDS Church has published more than 150 million copies of the Book of Mormon. The Community of Christ, formerly known as the Reorganized Church of Jesus Christ of Latter Day Saints, views the Book of Mormon as an additional witness of Jesus Christ and publishes two versions of the book through its official publishing arm, Herald House: the Authorized Edition, which is based on the original printer's manuscript, and the 1837 Second Edition (or "Kirtland Edition") of the Book of Mormon. Its content is similar to the Book of Mormon published by the LDS Church, but the versification is different. The Community of Christ also publishes a 1966 "Revised Authorized Edition", which attempts to modernize some language. In 2001, Community of Christ President W. Grant McMurray reflected on increasing questions about the Book of Mormon: "The proper use of The Book of Mormon as sacred scripture has been under wide discussion in the 1970s and beyond, in part because of long-standing questions about its historical authenticity and in part because of perceived theological inadequacies, including matters of race and ethnicity." At the 2007 Community of Christ World Conference, President Stephen M. Veazey ruled out-of-order a resolution to "reaffirm the Book of Mormon as a divinely inspired record." He stated that "while the Church affirms the Book of Mormon as scripture, and makes it available for study and use in various languages, we do not attempt to mandate the degree of belief or use. This position is in keeping with our longstanding tradition that belief in the Book of Mormon is not to be used as a test of fellowship or membership in the church." There are a number of other churches that are part of the Latter Day Saint movement. Most of these churches were created as a result of issues ranging from differing doctrinal interpretations and acceptance of the movement's scriptures, including the Book of Mormon, to disagreements as to who was the divinely chosen successor to Joseph Smith. These groups all have in common the acceptance of the Book of Mormon as scripture. It is this acceptance which distinguishes the churches of the Latter Day Saint movement from other Christian denominations. Separate editions of the Book of Mormon have been published by a number of churches in the Latter Day Saint movement, along with private individuals and foundations not endorsed by any specific denomination. The lack of correlation between locations described in the Book of Mormon and known, intact American archaeological sites. References to animals, plants, metals and technologies in the Book of Mormon that archaeological or scientific studies have found no evidence of in post-Pleistocene, pre-Columbian America, frequently referred to as anachronisms. Items typically listed include cattle, horses, asses, oxen, sheep, swine, goats, elephants, wheat, steel, brass, chains, iron, scimitars, and chariots. The lack of widely accepted linguistic connections between any Native American languages and Near Eastern languages. The lack of DNA evidence linking any Native American group to the ancient Near East. Most adherents of the Latter Day Saint movement consider the Book of Mormon to generally be a historically accurate account. Within the Latter Day Saint movement there are several apologetic groups that disagree with the skeptics and seek to reconcile the discrepancies in diverse ways. Among these apologetic groups, much work has been published by Foundation for Ancient Research and Mormon Studies (FARMS), and Foundation for Apologetic Information & Research (FAIR), defending the Book of Mormon as a literal history, countering arguments critical of its historical authenticity, or reconciling historical and scientific evidence with the text. One of the more common recent arguments is the limited geography model, which states that the people of the Book of Mormon covered only a limited geographical region in either Mesoamerica, South America, or the Great Lakes area. The LDS Church has published material indicating that science will support the historical authenticity of the Book of Mormon. The Book of Mormon was dictated by Joseph Smith to several scribes over a period of 13 months, resulting in three manuscripts. The 116 lost pages contained the first portion of the Book of Lehi; it was lost after Smith loaned the original, uncopied manuscript to Martin Harris. The first completed manuscript, called the original manuscript, was completed using a variety of scribes. Portions of the original manuscript were also used for typesetting. In October 1841, the entire original manuscript was placed into the cornerstone of the Nauvoo House, and sealed up until nearly forty years later when the cornerstone was reopened. It was then discovered that much of the original manuscript had been destroyed by water seepage and mold. Surviving manuscript pages were handed out to various families and individuals in the 1880s. Only 28 percent of the original manuscript now survives, including a remarkable find of fragments from 58 pages in 1991. The majority of what remains of the original manuscript is now kept in the LDS Church's Archives. The second completed manuscript, called the printer's manuscript, was a copy of the original manuscript produced by Oliver Cowdery and two other scribes. It is at this point that initial copyediting of the Book of Mormon was completed. Observations of the original manuscript show little evidence of corrections to the text. Shortly before his death in 1850, Cowdery gave the printer's manuscript to David Whitmer, another of the Three Witnesses. In 1903, the manuscript was bought from Whitmer's grandson by the Community of Christ, known at the time as the Reorganized Church of Jesus Christ of Latter-day Saints. On September 20, 2017, the LDS Church purchased the manuscript from the Community of Christ at a reported price of $35 million. The printer's manuscript is now the earliest surviving complete copy of the Book of Mormon, being nearly 100 percent extant. The manuscript was imaged in 1923 and was recently made available for viewing online. Critical comparisons between surviving portions of the manuscripts show an average of two to three changes per page from the original manuscript to the printer's manuscript, with most changes being corrections of scribal errors such as misspellings or the correction, or standardization, of grammar inconsequential to the meaning of the text. The printer's manuscript was further edited, adding paragraphing and punctuation to the first third of the text. The printer's manuscript was not used fully in the typesetting of the 1830 version of Book of Mormon; portions of the original manuscript were also used for typesetting. The original manuscript was used by Smith to further correct errors printed in the 1830 and 1837 versions of the Book of Mormon for the 1840 printing of the book. In the late 19th century the extant portion of the printer's manuscript remained with the family of David Whitmer, who had been a principal founder of the Latter Day Saints and who, by the 1870s, led the Church of Christ (Whitmerite). During the 1870s, according to the Chicago Tribune, the LDS Church unsuccessfully attempted to buy it from Whitmer for a record price. LDS president Joseph F. Smith refuted this assertion in a 1901 letter, believing such a manuscript "possesses no value whatever." In 1895, David Whitmer's grandson George Schweich inherited the manuscript. By 1903 Schweich had mortgaged the manuscript for $1,800 and, needing to raise at least that sum, sold a collection including 72-percent of the Book of the original printer's manuscript (John Whitmer’s manuscript history, parts of Joseph Smith’s translation of the Bible, manuscript copies of several revelations, and a piece of paper containing copied Book of Mormon characters) to the RLDS church (now the Community of Christ) for $2,450, with $2,300 of this amount for the printer's manuscript. The LDS Church had not sought to purchase the manuscript. In 2015 this remaining portion was published by the Church Historian's Press in its Joseph Smith Papers series, in Volume Three of "Revelations and Translations"; and, in 2017, the LDS Church bought the printer's manuscript for US$35,000,000. The original 1830 publication did not have verse markers, although the individual books were divided into relatively long chapters. Just as the Bible's present chapter and verse notation system is a later addition of Bible publishers to books that were originally solid blocks of undivided text, the chapter and verse markers within the books of the Book of Mormon are conventions, not part of the original text. Publishers from different factions of the Latter Day Saint movement have published different chapter and verse notation systems. The two most significant are the LDS system, introduced in 1879, and the RLDS system, which is based on the original 1830 chapter divisions. The RLDS 1908 edition, RLDS 1966 edition, the Church of Christ (Temple Lot) edition, and Restored Covenant editions use the RLDS system while most other current editions use the LDS system. Community of Christ 1966 "Revised Authorized Version", based on 1908 Authorized Version, 1837 edition and original manuscript. Notable for the omission of repetitive "it came to pass" phrases. The Church of Jesus Christ (Bickertonite) 2001 Compiled by a committee of Apostles. It uses the chapter and verse designations from the 1879 LDS version. Herald Heritage 1970 Facsimile of the 1830 edition. Bookcraft 1999 The Book of Mormon for Latter-day Saint Families. Large print with numerous visuals and explanatory notes. Doubleday 2006  The Book of Mormon: Another Testament of Jesus Christ. Text from the current LDS edition without footnotes. First Doubleday edition was in 2004. Experience Press 2006 Reset type matching the original 1830 edition in word, line and page. Fixed typographical errors. Stratford Books 2006 Facsimile reprint of 1830 edition. The following non-current editions marked major developments in the text or reader's helps printed in the Book of Mormon. Pratt and Goodson 1837 "Second edition" in Kirtland. Revision of first edition, using the printer's manuscript with emendations and grammatical corrections. Young, Kimball and Pratt 1841 "First European edition". 1837 reprint with British spellings. Future LDS Church editions descended from this, not the 1840 edition. Although some earlier unpublished studies had been prepared, not until the early 1970s was true textual criticism applied to the Book of Mormon. At that time BYU Professor Ellis Rasmussen and his associates were asked by the LDS Church to begin preparation for a new edition of the Holy Scriptures. One aspect of that effort entailed digitizing the text and preparing appropriate footnotes, another aspect required establishing the most dependable text. To that latter end, Stanley R. Larson (a Rasmussen graduate student) set about applying modern text critical standards to the manuscripts and early editions of the Book of Mormon as his thesis project—which he completed in 1974. To that end, Larson carefully examined the Original Manuscript (the one dictated by Joseph Smith to his scribes) and the Printer's Manuscript (the copy Oliver Cowdery prepared for the Printer in 1829–1830), and compared them with the 1st, 2nd, and 3rd editions of the Book of Mormon to determine what sort of changes had occurred over time and to make judgments as to which readings were the most original. Larson proceeded to publish a useful set of well-argued articles on the phenomena which he had discovered. Many of his observations were included as improvements in the 1981 LDS edition of the Book of Mormon. By 1979, with the establishment of the Foundation for Ancient Research and Mormon Studies (FARMS) as a California non-profit research institution, an effort led by Robert F. Smith began to take full account of Larson's work and to publish a Critical Text of the Book of Mormon. Thus was born the FARMS Critical Text Project which published the first volume of the 3-volume Book of Mormon Critical Text in 1984. The third volume of that first edition was published in 1987, but was already being superseded by a second, revised edition of the entire work, greatly aided through the advice and assistance of then Yale doctoral candidate Grant Hardy, Dr. Gordon C. Thomasson, Professor John W. Welch (the head of FARMS), Professor Royal Skousen, and others too numerous to mention here. However, these were merely preliminary steps to a far more exacting and all-encompassing project. In 1988, with that preliminary phase of the project completed, Professor Skousen took over as editor and head of the FARMS Critical Text of the Book of Mormon Project and proceeded to gather still scattered fragments of the Original Manuscript of the Book of Mormon and to have advanced photographic techniques applied to obtain fine readings from otherwise unreadable pages and fragments. He also closely examined the Printer's Manuscript (then owned by the Community of Christ—RLDS Church in Independence, Missouri) for differences in types of ink or pencil, in order to determine when and by whom they were made. He also collated the various editions of the Book of Mormon down to the present to see what sorts of changes have been made through time. Thus far, Professor Skousen has published complete transcripts of the Original and Printer's Manuscripts, as well as a six-volume analysis of textual variants. Still in preparation are a history of the text, and a complete electronic collation of editions and manuscripts (volumes 3 and 5 of the Project, respectively). Yale University has in the meantime published an edition of the Book of Mormon which incorporates all aspects of Skousen's research. Differences between the original and printer's manuscript, the 1830 printed version, and modern versions of the Book of Mormon have led some critics to claim that evidence has been systematically removed that could have proven that Smith fabricated the Book of Mormon, or are attempts to hide embarrassing aspects of the church's past with Mormon scholars viewing the changes as superficial, done to clarify the meaning of the text. The LDS version of the Book of Mormon has been translated into 83 languages and selections have been translated into an additional 25 languages. In 2001, the LDS Church reported that all or part of the Book of Mormon was available in the native language of 99 percent of Latter-day Saints and 87 percent of the world's total population. Translations into languages without a tradition of writing (e.g., Kaqchikel, Tzotzil) are available on audio cassette. Translations into American Sign Language are available on videocassette and DVD. Typically, translators are members of the LDS Church who are employed by the church and translate the text from the original English. Each manuscript is reviewed several times before it is approved and published. In 1998, the LDS Church stopped translating selections from the Book of Mormon, and instead announced that each new translation it approves will be a full edition. Events of the Book of Mormon are the focus of several LDS Church films, including The Life of Nephi (1915), How Rare a Possession (1987) and The Testaments of One Fold and One Shepherd (2000). Such films in LDS cinema (i.e., films not officially commissioned by the LDS Church) include The Book of Mormon Movie, Vol. 1: The Journey (2003) and Passage to Zarahemla (2007). Second Nephi 9:20–27 from the Book of Mormon is quoted in a funeral service in Alfred Hitchcock's film Family Plot. In 2003, a South Park episode titled "All About Mormons" parodied the origins of the Book of Mormon. In 2011, a long-running religious satire musical titled The Book of Mormon, by the South Park creators, premiered on Broadway, winning 9 Tony Awards, including best musical. Its London production won the Olivier Award for best musical. The LDS Church, which distributes free copies of the Book of Mormon, reported in 2011 that 150 million copies of the book have been printed since its initial publication. The initial printing of the Book of Mormon in 1830 produced 5000 copies. The 50 millionth copy was printed in 1990, with the 100 millionth following in 2000 and reaching 150 million in 2011. The Book of Mormon has occasionally been analyzed in a non-religious context for its literary merits. The author labored to give his words and phrases the quaint, old-fashioned sound and structure of our King James's translation of the Scriptures; and the result is a mongrel -- half modern glibness, and half ancient simplicity and gravity. The latter is awkward and constrained; the former natural, but grotesque by the contrast. Whenever he found his speech growing too modern -- which was about every sentence or two -- he ladled in a few such Scriptural phrases as "exceeding sore," "and it came to pass," etc., and made things satisfactory again. "And it came to pass" was his pet. If he had left that out, his Bible would have been only a pamphlet. Non-Mormons attempting psychiatric analyses [Of Joseph Smith] have been content to pin a label upon the youth and have ignored his greatest creative achievement because they found it dull. Dull it is, in truth, but not formless, aimless, or absurd. Its structure shows elaborate design, its narrative is spun coherently, and it demonstrates throughout a unity of purpose. Its matter is drawn directly from the American frontier, from the impassioned revivalist sermons, the popular fallacies about Indian origin, and the current political crusades. Searching for literary wonders in the Book of Mormon is a bit like seeking lyrical inspiration in the books of Chronicles or Judges. The Book of Mormon is a work of substantial complexity, however, with numerous well-spun narratives subsumed with a larger comprehensive vision There is a neat symmetry to the bible as we have received it. The Book of Mormon remains a potent and disruptive force in the twenty-first century, challenging analysis with its authoritative claims. The Book remains an important cultural document of the nineteenth century and its literary merits are beginning to encourage further enquiry. The growth of Mormonism worldwide is also challenging older questions of wider appeal and accessibility of the Book of Mormon. The themes of the dislocation and decentring are coming to greater relevance in a globalised world. The Book of Mormon began as 588 densely printed pages in 1830, and the current official edition (reformatted with substantial grammatical editing) still runs to 531 pages. In some ways this is surprising. If the primary purpose of the Book of Mormon were to function as a sign—as tangible evidence that Joseph Smith was a true prophet of God—that mission could have been accomplished much more concisely. A fifty page book delivered by an angel is no less miraculous than a thick volume; it's the heavenly messenger part that makes it hard to believe. True or not, the Book of Mormon is a powerful epic written on a grand scale with a host of characters, a narrative of human struggle and conflict, of divine intervention, heroic good and atrocious evil, of prophecy, morality, and law. Its narrative structure is complex. The idiom is that of the King James Version, which most Americans assumed to be appropriate for divine revelation.... The Book of Mormon should rank among the great achievements of American literature, but it has never been accorded the status it deserves, since Mormons deny Joseph Smith's authorship, and non-Mormons, dismissing the work as a fraud, have been more likely to riducule than to read it. ^ Hinckley, Gordon B. (November 4, 1979). "Joseph Smith: 'Praise to the Man'". BYU.edu. Retrieved July 30, 2018. ^ Roberts (1902, pp. 11, 18–19). ^ a b Tanner, Jerald and Sandra (1987). Mormonism - Shadow or Reality?. Utah Lighthouse Ministry. p. 91. ISBN 978-99930-74-43-4. ^ a b c d Brody, Fawn (1971). No Man Knows My History: The Life of Joseph Smith (2d ed.). New York: Alfred A. Knopf. ^ a b c d Krakauer, Jon (2003). Under the Banner of Heaven: A Story of Violent Faith. New York: Doubleday. ^ Simon G. Southerton. Losing a Lost Tribe: Native Americans, DNA, and the Mormon Church (2004, Signature Books). ^ a b c "Book of Mormon Reaches 150 Million Copies", lds.org, 2011-04-20. ^ a b "The Life and Ministry of Joseph Smith", Teachings of Presidents of the Church: Joseph Smith (2007), xxii–25. ^ a b "Book of Mormon Translation", LDS.org, LDS Church, n.d.
^ a b Brodie, Fawn M. (1995). No man knows my history: the life of Joseph Smith, the Mormon prophet (rev. and enl. 2nd ed.). New York: Vintage Books. pp. 53, 61. ISBN 978-0679730545. ^ Smith, Joseph, Jr. (March 1, 1842). "Wentworth Letter/Church History". Times and Seasons. Nauvoo, Illinois. 3 (9): 906–936. ^ "Testimony of Three Witnesses". ^ "Testimony of Eight Witnesses". ^ Kunz, Ryan (March 2010). "180 Years Later, Book of Mormon Nears 150 Million Copies". Ensign: 74–76. Retrieved 2011-03-24. ^ Abanes, Richard (2003). One Nation Under Gods: A History of the Mormon Church. Thunder's Mouth Press. p. 72. ISBN 978-1-56858-283-2. ^ Tanner, Jerald and Sandra (1987). Mormonism - Shadow or Reality?. Utah Lighthouse Ministry. pp. 73–80. ISBN 978-99930-74-43-4. ^ Abanes, Richard (2003). One Nation Under Gods: A History of the Mormon Church. Thunder's Mouth Press. p. 68. ISBN 978-1-56858-283-2. ^ Tanner, Jerald and Sandra (1987). Mormonism - Shadow or Reality?. Utah Lighthouse Ministry. pp. 84–85. ISBN 978-99930-74-43-4. ^ Roberts, Brigham H. (1992). Brigham D. Madsen (ed.). Studies of the Book of Mormon. Salt Lake City, UT: Signature Books. ISBN 978-1-56085-027-4. ^ Spaulding, Solomon (1996). Reeve, Rex C (ed.). Manuscript Found: The Complete Original "Spaulding" Manuscript. Provo, Utah: Religious Studies Center, Brigham Young University. ^ Roper, Matthew (2005). "The Mythical "Manuscript Found"". FARMS Review. 17 (2): 7–140. Archived from the original on 2007-02-18. Retrieved 2007-01-31. ^ "Book of Mormon/Plagiarism accusations - FairMormon". en.fairmormon.org. Retrieved 2016-01-13. ^ "Criticism of Mormonism/Books/One Nation Under Gods - FairMormon". en.fairmormon.org. Retrieved 2016-01-13. ^ "Review of Mormonism: Shadow or Reality?". Review of Books on the Book of Mormon 4/1 (1992) > Mormonism: Shadow or Reality?. Retrieved 2016-01-13. ^ "Criticism of Mormonism/Books/No Man Knows My History: The Life of Joseph Smith - FairMormon". en.fairmormon.org. Retrieved 2016-01-13. ^ "Criticism of Mormonism/Books/Under the Banner of Heaven/Index - FairMormon". en.fairmormon.org. Retrieved 2016-01-13. ^ "The Historical Case against Sidney Rigdon's Authorship of the Book of Mormon". Neal A. Maxwell Institute for Religious Scholarship. Retrieved 2016-01-13. ^ a b "The limited success so far in swaying popular LDS opinion is a constant source of frustration for Mormon apologists...It appears that Mormons are generally content to picture the Book of Mormon story in a setting that is factually wrong. For most Mormons, the limited geography models create more problems than they solve. They run counter to the dominant literal interpretation of the text and contradict popular folklore as well as the clear pronouncements of all church presidents since the time of Joseph Smith", Simon G. Southerton (2004, Signature Books), Losing a Lost Tribe, pp. 164-165. "Some of the [Community of Christ]'s senior leadership consider the Book of Mormon to be inspired historical fiction. For leaders of the Utah church, this is still out of the question. [The leadership], and most Mormons, believe that the historical authenticity of the Book of Mormon is what shores up Joseph Smith's prophetic calling and the divine authenticity of the Utah church", Southerton (2004), pg. 201. Quotations from temple dedicatory sermons and prayers in Central and South America by President Gordon B. Hinckley in 1999-2000 continually refer to Native LDS members in attendance as "children of Lehi" (Southerton , pp. 38-39). "Latter-Day Saints believe their scripture to be history, written by ancient prophets", Grant Hardy (2009, Yale University Press), "Introduction," The Book of Mormon: The Earliest Text, ed. Royal Skousen, pg. x. ^ Joseph Smith stated that the "title page is not by any means a modern composition either of mine or of any other man's who has lived or does live in this generation." ^ Smith, Joseph (October 1842). "Truth Will Prevail". Times and Seasons. III (24): 943. Retrieved 2009-01-30. ^ Book of Mormon Title Page. ^ a b "A Brief Explanation about the Book of Mormon". ^ Joseph L. Allen, Sacred Sites: Searching for Book of Mormon Lands (2003) p. 8. ^ Gary J. Coleman, "The Book of Mormon: A Guide for the Old Testament", Ensign, January 2002. ^ Susan Ward Easton, "Names of Christ in the Book of Mormon", Ensign, July 1978. ^ a b Ether 3:16. ^ 1 Nephi 2:20; 1 Nephi 13:30; 2 Nephi 1:5; 2 Nephi 10:19; Jacob 5:43; Ether 1:38–42; Ether 2:7,10-15; Ether 9:20; Ether 10:28; Ether 13:2. ^ 1 Nephi 2:20; 1 Nephi 4:14; 2 Nephi 1:20; 2 Nephi 4:4; Jarom 1:9; Omni 1:6; Mosiah 1:7; Mosiah 2:22,31; Alma 9:13; Alma 36:1,30; Alma 38:1; Alma 48:15,25. ^ a b 3 Nephi 26:19. ^ Jacob 2:13–13; Alma 4:6; Alma 5:53; 4 Nephi 1:24. ^ Millet, Robert L. (2007). Strathearn, Gaye; Swift, Charles (eds.). The Most Correct Book: Joseph Smith's Appraisal. Provo, Utah: Religious Studies Center, Brigham Young University. pp. 55–71. ISBN 978-1-59038-799-3. ^ Doctrine and Covenants 84:54–57. ^ The other texts are the Bible (King James Version), the Doctrine and Covenants, and the Pearl of Great Price: Nelson, Russell M. (November 2000), "Living by Scriptural Guidance", Ensign: 16–18 (discussing how the four standard works of the church can provide guidance in life). ^ a b c Ezra Taft Benson, "The Book of Mormon—Keystone of Our Religion", Ensign, November 1986. ^ James E. Faust, "The Keystone of Our Religion", Ensign, January 2004. ^ Ziff. "Which GAs Prefer Which Books of Scripture?". Zelophads Daughters. Retrieved 14 April 2016. ^ "Since 1982, subtitle has defined book as 'another testament of Jesus Christ'", Church News, 1988-01-02. ^ "Book of Mormon: Another Testament of Jesus Christ", mormonnewsroom.org. ^ Boyd K. Packer, "Scriptures", Ensign, November 1982. ^ Ezra Taft Benson, "Cleansing the Inner Vessel", Ensign, May 1986. ^ a b Ezra Taft Benson, "Flooding the Earth with the Book of Mormon", Ensign, November 1988. ^ Dallin H. Oaks, "'Another Testament of Jesus Christ'", Ensign, March 1994 (reporting that Benson told a meeting of church leaders on 5 March 1987 that "[t]his condemnation has not been lifted, nor will it be until we repent"). ^ Gordon B. Hinckley, "A Testimony Vibrant and True", Ensign, August 2005. ^ "Book of Mormon: 150 Million Copies". The Church of Jesus Christ of Latter-day Saints. Retrieved 9 April 2012. ^ McMurray, W. Grant, "They 'Shall Blossom as the Rose': Native Americans and the Dream of Zion," an address delivered February 17, 2001, cofchrist.org. ^ Andrew M. Shields, "Official Minutes of Business Session, Wednesday March 28, 2007," in 2007 World Conference Thursday Bulletin, March 29, 2007. Community of Christ, 2007. ^ Robinson, B.A. (June 8, 2010). "The LDS Restorationist movement, including The Church of Jesus Christ of Latter-day Saints". ReligiousTolerance.org. Ontario Consultants on Religious Tolerance. Retrieved 2013-01-01. Page xv: "Anthropolgists and archaeologists, including some Mormons and former Mormons, have discovered little to support the existence of [Book of Mormon] civilizations. Over a period of 150 years, as scholars have seriously studied Native American cultures and prehistory, evidence of a Christian civilization in the Americas has eluded the specialists...These [Mesoamerican] cultures lack any trace of Hebrew or Egyptian writing, metallurgy, or the Old World domesticated animals and plants described in the Book of Mormon." While most scientific organizations simply ignore the Book of Mormon just as they ignore the Bible and other religious books as sources of scientific information (), the Smithsonian Institution and the National Geographic Society have issued explicit denials that the Book of Mormon has ever been used in scientific research sponsored by their organizations. The Book of Mormon is often included in lists of archeological "hoaxes" such as "Williams takes on the Cardiff Giant, the Grave Creek Stone, the Lenape Stone, the Holly Oak Pendant, the Walam Olum, the Paleolithic tools of the Trenton Gravels, Atlantis, Mu, the book of Mormon and its associated finds of Holy Stones, various and sundry rune stones, Thor Heyerdahl, the Tucson Crosses, Mystery Hill, George Carter's pre-pre-Clovis occupations of North America, "psychic archaeology," and other "fantasies."" Jay F. Custer, "Review of 'Fantastic Archaeology: The Wild Side of North American Prehistory' by Stephen Williams", American Antiquity (1993) 58:372-373. ^ The exceptions are several LDS organizations that sponsor historical and archeological research, such as FairMormon, Foundation for Ancient Research and Mormon Studies, and Brigham Young University; and LDS journals. ^ Citing the lack of specific New World geographic locations to search, Michael D. Coe, a prominent Mesoamerican archaeologist and Professor Emeritus of Anthropology at Yale University, writes (in a 1973 volume of Dialogue: A Journal of Mormon Thought): "As far as I know there is not one professionally trained archaeologist, who is not a Mormon, who sees any scientific justification for believing [the historicity of The Book of Mormon], and I would like to state that there are quite a few Mormon archaeologists who join this group." LDS scholars think that this may be a product of reassigning familiar labels to unfamiliar items. For example, the Delaware Indians named the cow after the deer, and the Miami Indians labeled sheep, when they were first seen, "looks-like-a cow." Simon G. Southerton. 2004. Losing a Lost Tribe: Native Americans, DNA, and the Mormon Church. Signature Books. ^ editor, Dennis L. Largey, general (2003). Book of Mormon reference companion. Salt Lake City, Utah: Deseret Book. ISBN 978-1573452311. ^ a b c d e f g h Skousen, Royal. "Changes in the Book of Mormon" (Transcription of live presentation). 2002 FAIR Conference: FAIR. Retrieved 2009-09-25. ^ a b "LDS FAQ: Changes in the Book of Mormon". JeffLindsay.com. November 27, 2012. Retrieved 2013-01-01. ^ Toone, Trent (2015-08-06). "Recounting the preservation of the printer's manuscript of the Book of Mormon". DeseretNews.com. Retrieved 2017-09-23. ^ "Church Acquires Printer's Manuscript of Book of Mormon". mormonnewsroom.org. Retrieved 2017-09-21. ^ Walch, Tad (20 September 2017). "LDS Church buys printer's manuscript of Book of Mormon for record $35 million". Deseret (Salt Lake City) News. Retrieved 22 September 2017. ^ "Printer's Manuscript of the Book of Mormon, 1923 Photostatic Copies". josephsmithpapers.org. pp. 0–464. Retrieved 2016-01-13. ^ "3. "A History of All the Important Things" (D&C 69:3): John Whitmer's Record of Church History | Religious Studies Center". Rsc.byu.edu. Retrieved 2017-09-25. ^ Montgomeryrmontgomery, Rick (2017-09-21). "Book of Mormon manuscript may be world's most expensive book | The Kansas City Star". Kansascity.com. Retrieved 2017-09-25. ^ Mims, Bob (2017-09-21). "Historian: At $35M, original printer's manuscript of Book of Mormon a bargain - The Salt Lake Tribune". Sltrib.com. Retrieved 2017-09-25. ^ The Zarahemla Research Foundation publishes a 48-page booklet titled "Book of Mormon Chapter & Verse: RLDS–LDS Conversion Table" to enable readers of an LDS edition to find references from an RLDS edition and vice versa. ^ a b c d e f g h i j Skousen, Royal (1992). "Book of Mormon Editions (1830–1981)". In Ludlow, Daniel H (ed.). Encyclopedia of Mormonism. New York: Macmillan Publishing. pp. 175–6. ISBN 978-0-02-879602-4. OCLC 24502140. ^ "Church Releases New Edition of English Scriptures in Digital Formats". lds.org. The Church of Jesus Christ of Latter-day Saints. Retrieved 6 March 2013. ^ Reeve, W. Paul; Parshall, Ardis E. (August 13, 2010). Mormonism: A Historical Encyclopedia: A Historical Encyclopedia. ABC-CLIO. p. 74. ISBN 9781598841084. Retrieved March 24, 2018. ^ BYU Catalog for "Book of Mormon. English. 1840 (1992)"
^ Johnson, D. Lynn (2000). "The Restored Covenant Edition of the Book of Mormon—Text Restored to Its Purity?". FARMS Review. 12 (2). Archived from the original on 2008-10-16. Retrieved 2009-02-12. ^ Moore, Carrie A. (November 9, 2007). "Intro change in Book of Mormon spurs discussion". Deseret News. Retrieved 2009-08-26. ^ Moore, Carrie A. (November 11, 2004). "Doubleday Book of Mormon is on the way". Deseret News. Retrieved 2009-08-26. ^ "The Book of Mormon - Skousen, Royal; Smith, Joseph". Yale University Press. Retrieved 2009-09-22. ^ Crawley, Peter (1997). A Descriptive Bibliography of the Mormon Church, Volume One 1830–1847. Provo, Utah: Religious Studies Center, Brigham Young University. p. 151. ISBN 978-1-57008-395-2. Archived from the original on 11 June 2011. Retrieved 2009-02-12. ^ Woodger, Mary Jane (2000). "How the Guide to English Pronunciation of Book of Mormon Names Came About". Journal of Book of Mormon Studies. 9 (1). Retrieved 2009-02-21. ^ Stanley R. Larson, “A Study of Some Textual Variations in the Book of Mormon, Comparing the Original and Printer's MSS., and Comparing the 1830, 1837, and 1840 Editions,” unpublished master's thesis (Provo: BYU, 1974). ^ Stanley Larson, “Early Book of Mormon Texts: Textual Changes to the Book of Mormon in 1837 and 1840,” Sunstone, 1/4 (Fall 1976), 44–55; Larson, “Textual Variants in the Book of Mormon Manuscripts,” Dialogue: A Journal of Mormon Thought, 10/4 (Autumn 1977), 8–30 [FARMS Reprint LAR-77]; Larson, “Conjectural Emendation and the Text of the Book of Mormon,” BYU Studies, 18 (Summer 1978), 563–569 [FARMS Reprint LAR-78]. ^ Robert F. Smith, ed., Book of Mormon Critical Text, 2nd ed., 3 vols. (Provo: FARMS, 1986–1987). ^ The Original Manuscript of the Book of Mormon (Provo: FARMS, 2001); The Printer's Manuscript of the Book of Mormon, 2 vols. (FARMS, 2001). ^ Analysis of Textual Variants of the Book of Mormon, 6 vols. (Provo: FARMS, 2004–2009) -- now superseded by a second ed. ^ Skousen, ed., The Book of Mormon: The Earliest Text (Yale Univ. Press, 2009). ^ "Book of Mormon textual changes". Fairmormon. Fairmormon. Retrieved 18 December 2017. ^ "Who's Nominated? – All Categories". tonyawards.com. May 3, 2011. Retrieved May 3, 2011. ^ "150 Million and Counting: The Book of Mormon reaches another milestone", Church News, 2011-04-18. ^ Givens, Terryl (2009). The Book of Mormon: A Very Short Introduction. Oxford: Oxford University Press. pp. 60–61. ISBN 9780195369311. OCLC 301705600. ^ Hardy, Grant (2010). Understanding the Book of Mormon : a reader's guide. Oxford: Oxford University Press. p. 5. ISBN 9780199731701. OCLC 436310425. Brewster, Quinn (1996). "The Structure of the Book of Mormon: A Theory of Evolutionary Development". Dialogue: A Journal of Mormon Thought. 29 (2): 109–140. Archived from the original on July 22, 2007. .
Bushman, Richard Lyman (2005). Joseph Smith: Rough Stone Rolling. New York: Knopf. ISBN 978-1-4000-4270-8. Dunn, Scott C (2002). "Automaticity and the Dictation of the Book of Mormon". In Vogel, Dan; Metcalf, Brent Lee (eds.). American Apocrypha: Essays on the Book of Mormon. Salt Lake City, Utah: Signature Books. pp. 17–46. ISBN 978-1-56085-151-6. Faulring, Scott H (June 2000). "The Return of Oliver Cowdery". The Disciple as Witness: Essays on Latter-day Saint History and Doctrine in Honor of Richard Lloyd Anderson. Provo, Utah. Archived from the original on 2007-10-13. Givens, Terryl (2002). By the Hand of Mormon: The American Scripture That Launched a New World Religion. Oxford University Press. ISBN 978-0-19-516888-4. Hitchens, Christopher (2007). god is not Great. New York: Twelve. Howe, Eber Dudley (1834). Mormonism Unvailed: Or, A Faithful Account of that Singular Imposition and Delusion, from its Rise to the Present Time. Painesville, Ohio: Telegraph Press. Jessee, Dean (1970). "The Original Book of Mormon Manuscript" (PDF). BYU Studies. 10 (3): 1. Archived from the original (PDF) on September 10, 2008. Midgley, Louis C (1997). "Who Really Wrote the Book of Mormon? : The Critics and Their Theories". In Reynolds, Noel B (ed.). Book of Mormon Authorship Revisited: The Evidence for Ancient Origins. Provo, Utah: Foundation for Ancient Research and Mormon Studies. pp. 101–139. ISBN 978-0-934893-25-1. Persuitte, David (2000). Joseph Smith and the Origins of The Book of Mormon (second ed.). McFarland & Company. ISBN 978-0-7864-0826-9. Price, Robert M (2002). "Prophecy and Palimpsest". Dialogue: A Journal of Mormon Thought. 35 (3). Roberts, Brigham H (1985). Madsen, Brigham D. (ed.). Studies of the Book of Mormon. Urbana, Illinois: University of Illinois Press. ISBN 978-0-252-01043-9. Foundation for Ancient Research & Mormon Studies. (2001a). "Original manuscript of the Book of Mormon: typographical facsimile of the extant text". In Skousen, Royal (ed.). Book of Mormon Critical Text Project. Provo, Utah: Foundation for Ancient Research and Mormon Studies. ISBN 978-0-934893-04-6. Foundation for Ancient Research & Mormon Studies. (2001b). Skousen, Royal (ed.). Book of Mormon Critical Text Project. 2–1. Provo, Utah: Foundation for Ancient Research and Mormon Studies. ISBN 978-0-934893-05-3. Foundation for Ancient Research & Mormon Studies. (2001b). "Printer's manuscript of the Book of Mormon: typographical facsimile of the entire text in two parts". In Skousen, Royal (ed.). Book of Mormon Critical Text Project. 2–2. Provo, Utah: Foundation for Ancient Research and Mormon Studies. ISBN 978-0-934893-06-0. Royal Skousen. (2004). "Analysis of textual variants of the Book of Mormon". In Skousen, Royal (ed.). Book of Mormon Critical Text Project. 4–1. Provo, Utah: Foundation for Ancient Research and Mormon Studies. ISBN 978-0-934893-07-7. Royal Skousen. (2005). "Analysis of textual variants of the Book of Mormon". In Skousen, Royal (ed.). Book of Mormon Critical Text Project. 4–2. Provo, Utah: Foundation for Ancient Research and Mormon Studies. ISBN 978-0-934893-08-4. Skousen, Royal (2006). "Analysis of textual variants of the Book of Mormon". In Skousen, Royal (ed.). Book of Mormon Critical Text Project. 4–3. Provo, Utah: Foundation for Ancient Research and Mormon Studies. ISBN 978-0-934893-11-4. .
Smith, Joseph, Jr. (March 26, 1830). The Book of Mormon: An Account Written by the Hand of Mormon, Upon Plates Taken from the Plates of Nephi. Palmyra, New York: E. B. Grandin. Smith, Joseph, Jr. (July 1838). "Editor's note". Elders' Journal of the Church of Jesus Christ of Latter Day Saints. 1 (3). Spaulding, Solomon (1996). Reeve, Rex C (ed.). Manuscript Found: The Complete Original "Spaulding" Manuscript. Provo, Utah: Religious Studies Center, Brigham Young University. Tvedtnes, John A (1984). "Isaiah Variants in the Book of Mormon". Featured Papers. Provo, Utah: Maxwell Institute. Van Wagoner, Richard S.; Walker, Steven C. (Summer 1982). "Joseph Smith: The Gift of Seeing". Dialogue: A Journal of Mormon Thought. 15 (2): 48–68. Vogel, Dan (2004). Joseph Smith: The Making of a Prophet. Salt Lake City: Signature Books. ISBN 978-1-56085-179-0. Paul C. Gutjahr (2012). The Book of Mormon: A Biography. Lives of Great Religious Books. Princeton University Press. ISBN 978-0-691-14480-1. JSTOR j.ctt7s5sf. Noel B. Reynolds (1997). Book of Mormon Authorship Revisited: The Evidence for Ancient Origins. Foundation for Ancient Research and Mormon Studies (FARMS). ISBN 978-0-934893-25-1. OCLC 36877441. Roy A. Cheville (1964). Scriptures from Ancient America: a Study of the Book of Mormon. Harald Publishing House. Brent Lee Metcalfe, ed. (1993). New Approaches to the Book of Mormon: Explorations in Critical Methodology. Signature Books. ISBN 978-1-56085-017-5. OCLC 25788077. Dan Vogel and Brent Metcalfe, ed. (2002). American Apocrypha: Essays on the Book of Mormon. Signature Books. ISBN 978-1-56085-151-6. OCLC 47870060. Grant H. Palmer (2002). An Insider's View of Mormon Origins. Signature Books. ISBN 978-1-56085-157-8. OCLC 50285328. Simon G. Southerton (2004). Losing a Lost Tribe: Native Americans, DNA, and the Mormon Church. Signature Books. ISBN 978-1560851813. OCLC 55534917. Daniel C. Peterson, ed. (2008). The Book of Mormon and DNA Research. Neal A. Maxwell Institute for Religious Scholarship. ISBN 9780842527064. OCLC 226304684. Terryl L. Givens (2002). By the Hand of Mormon: The American Scripture that Launched a New World Religion. Oxford University Press. ISBN 978-0195138184. OCLC 47838555. John L. Sorenson (2013). Mormon's Codex: An Ancient American Book. Neal A. Maxwell Institute for Religious Scholarship (BYU) and Deseret Book. ISBN 9781609073992. OCLC 828334040. Reynolds, George (1888). The Story of the Book of Mormon. Salt Lake City, Utah: Jos. Hyrum Parry. p. 494. Ludlow, Daniel H., ed. (1992). "Book of Mormon". Encyclopedia of Mormonism. New York, NY: Macmillan. pp. 139–216. ISBN 978-0-02-904040-9. OCLC 24502140.